indus must remember one simple thing that Vedas and Puranas clearly mention that at the end of Kaliyuga, Lord Vishnu will take Kalki Avatar to annihilate the adharmis and make way for Satyuga. There is never any mention of any other Avatars apart from Kalki Avatar that too at the end of Kaliyuga. So called god Shirdi Sai Baba, a meat eater was neither an avatar nor a god, has no mention in any Vedic texts. Lord Krishna’s temple was used to build monument of fake god Sai Baba in Shirdi. Sai Baba’s dead body was sepulchered in a small monument, removing Lord Krishna’s idol. Throughout his life Sai Baba never came out of Shirdi, neither entered any Hindu temple, nor recited chants of Hindu gods. This Chand Mia (Sai Baba) always remained a devout muslim and followed islamic rituals of killing animals and eating flesh. But when this marijuana (ganja) addict Chand Miya was nearing his death, he strongly insisted that his filthy body be sepulchered in Hindu temple of Lord Krishna which was located nearby – whose priests were always against Sai Baba’s policy of bluffing innocent local Hindus. HOW CAN HINDUS of that time tolerate this, that they replaced Supreme Godhead Lord Krishna’s idol with filthy dead body of biggest thug in the world’s history on religion, after Muhammed, Sai Baba – a staunch musalman. Some pro sai baba disciples started doing puja and reciting aartis (these aartis were initially made replacing Hindu god names with filthy sai baba’s) on the dead body of drug addict baba. What an irony !! !..A person who was practicing muslim through out his life was being prayed by Hindus !! !…that too with rituals that he hated the most. Almost a century after his death – thanks to the blind devotion and dishonest,deluded propaganda of millions of mindless devotees , some of my friends and relatives are life-long devotees and die-hard fans of this so-called “saint”. They believe in Sai Baba’s miracles so much that even the smallest things are now considered miracles divinely executed by this baba(Pir). When I analyze their behavior, I see how ludicrous and farcical these claims are. You will be amazed at what passes off as miracles and keep wondering how apparently nice, sane, intelligent people can believe, participate and propagate such ridiculous claims of miracles by a long-dead Muslim Pir? Originally written in Marathi by Mohaniraj Pandit and later translated into English. Source: Publications of the Shirdi Sai Baba Sansthan.The 11 promises made by Sai Baba above are all lies. Only God Himself can answer prayers. Only God can remedy sorrow and suffering. Saibaba is not Almighty God! Please don’t be misled friend, Sai Baba is another Satanic scam designed by the Devils.You need the Truth, but Sai Baba speaks great boastful lies. Sai Baba is NOT the God . Sai Baba is a false god who fronts for Satan, There are many false prophets and false gods who make all kinds of promises, but you must keep in mind that this Satan(sai baba) is the father of all liars. Ah! 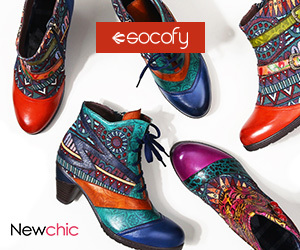 what poetic and beautiful double talk to confuse and confound his devotees. This sentence makes no sense at all other than to blind and deluded devotees of Sai who are always trying to find the divine, the mysterious, the transcendental in him and the “deeper” meaning in his words. If I understood it correctly, this statement is extremely shrewd in its application. It is meant to claim responsibility when miracles occur and yet deny his participation when they don’t occur. This is the age old trick of all these so-called God men. They make promises in such a way that it seems similar to the “heads-I-win-tails-you-lose” deal. So when a miracle occurs they can claim all responsibility but when it doesn’t, that’s always the devotees fault. It’s always “you didn’t pray enough”, “you didn’t believe enough” or “Sai in his divine wisdom knows best”. Oh Yes, Thats right. What do you want to believe, Sai Baba’s false promises,his lies or ALLMIGHTY GOD? Please don’t allow Satan to continue blinding you.In all the writings and promises of Sai Baba, there is NO mention of sin. This is typical of the New Age crowd, they teach that there is no right or wrong, only energy (which is exactly what is taught in the evil Harry Potter series). ‘Saibaba is great! He will take care of our sins’. That is the attitude of the devotees. New Age religions such as Baha’i and Sai Baba don’t address the issue of sin because it would make it more difficult to deceive people.The Karma define as under is the right answer to the human’s misery and happiness. Anything determined will be result of his fate. God created ALL things, NOT Sai Baba! 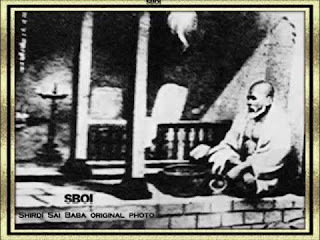 All beings did NOT arise from Sai Baba! Samadhi is common practice among Hindu saints and sages. Disciples of sai baba wrongly pose sai baba’s mazar as samadhi structure. They don’t know the major difference between Samadhi and dying out of illness. Samadhi is death at will while sai baba died due to long term illness (nephritis and hepatic due to excessive meat eating) and not at his will. So sai baba cannot be even compared to ordinary pious Sadhus or Sages who took Samadhis but never boasted or called themselves as gods. Then how can sai baba be called anant koti brahmand nayak (king of millions of universes) when he cannot even treat his own illness, which occurred due to eating of stale meats. How can this thug be called King of Universes ??? ?….All the references used for Hindus gods are being inferred while praising FAKE god sai baba..Why ?? ?..Just to drag Hindus and make them believe this filthy human being. To promote sai baba prominently among innocent Hindus, who strongly believe in Vedic Gods. Some sai baba’s followers insert baba’s images in-between Hindu gods Lord Krishna, Shiv Parvati or Lord Ganesha. This is just a wicked ploy to connect an ordinary drug addict with Hindu gods – as if this islamic thug was reincarnation of Hindu gods – what a dubious and filthy bluff when he himself hated Hinduism his entire life. Do not fall into trap of fake promises made by false god sai baba in Sai Sat charita. Sai Baba is a false god who fronts for Satan, There are many fallacious prophets and misleading godmen who make all kinds of promises, but you must keep in mind that this Satan(sai baba) was the father of all liars. Sai Baba’s followers are using Sai Baba as a brand name in Shirdi and other cities to collect millions of funds from Hindu devotees and then siphon off the money, it is also controlled by regional ministers so everything is managed, loot is still ongoing. The most painful factor is that these so called Sai Baba Sansthans or Trust never utilize money in development of poor Hindus or on free hospitals or free schooling. All funds received from Hindu devotees are fraudulently distributed among trustees. साँई माँसाहार का प्रयोग करता था व स्वयं जीवहत्या करता था! Baba said: I am going to kill goat in mosque, He told Shama to ask Haji what he likes to eat “meat of goat or it’s testicles”. A feeble, weak goat was brought in the mosque for sacrificial killing. Baba asked for knife to kill the goat. Then Baba told Kakasaheb that he will himself carry out this sacrificial killing of goat. Baba used to feast on meat, fish with fakirs. Sometimes Baba used to make sweet rice other times meat biryani. That Ekadashi Baba gave Dada Kelkar some money to bring meat. Dada Kelkar was devout Brahmin and always followed Vedic rituals, but still Baba made him bring this meat. Would any sane Hindu follow Sai Baba, who was always practicing islam and staunch muslim, and who insisted on removal of Lord Krishna pious murti from Bihari ji’s temple to replace with his illness ridden dead body. …………….इसलिए मेरे भक्तों का पुनर्जन्म नही होता !! Votaries of the Devas go to the Devas (gods); to the Pitrs (ancestors), go their votaries; to the Bhutas (demons), go the Bhuta worshippers; My votaries too come unto Me……That’s why they attain Moskha; renouncement from birth-death cycles. भूत प्रेत, मूर्दा (खुला या दफ़नाया हुआ अर्थात् कब्र) को सकामभाव से पूजने वाले स्वयं मरने के बाद भूत-प्रेत ही बनते हैं.! So worshiping dead body or mazar is like worshiping Bhuta or Pisach and then attaining them itself. 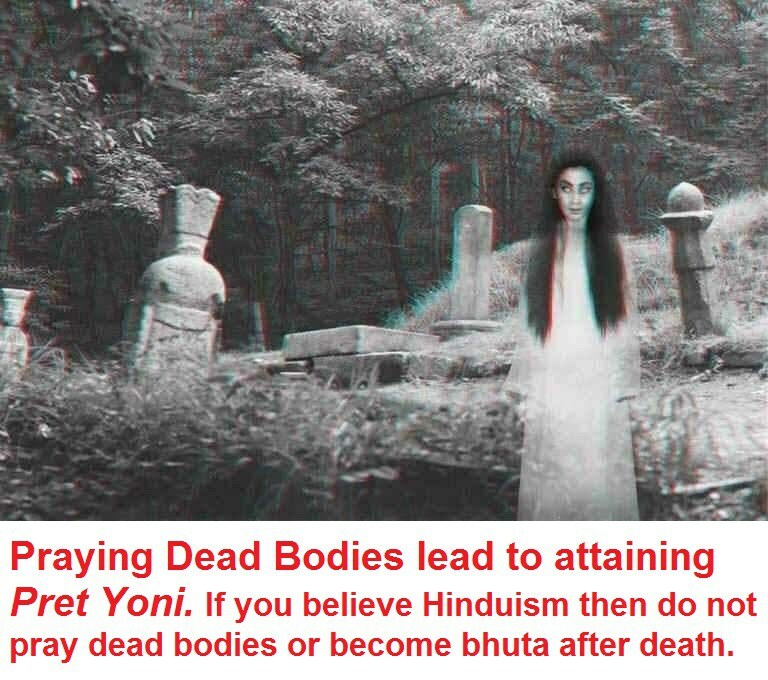 So If Hindus who pray sai baba want to become bhut or pisach (filthy beings who roam endlessly to attain freedom from pret or bhut yoni but never are able to do so due to their past deeds) after death can continue to do so. Sai Baba was Created to Invoke Cultural Terrorism Among Indians. And these anti-Hindu brigade are almost successful as our own Hindus are becoming Bhakts of this Thug “Shirdi Ka Sai Baba”. It is our responsibility to pass on factual legacy to our children so that they do not become Victim of this cultural terrorism. Lets comprehend Vedic knowledge and STOP cultural destruction of our Hindu values. Hindu brothers and sisters – Spread the Knowledge of of this Truth and consider only Lord Krishn as omnipresent Supreme Godhead. The Video below the post is expose’ of a devout Hindu who had debate with a priest of Sai Baba temple (remember this temple was build removing Hanuman Ji’s murti and replacing it with fake god Sai Baba to fool Hindus). It’s happening across India where Rambhakt Hanuman’s or Lord Ram’s temples are demolished or revamped to accommodate fake god Sai Baba. Also to make Hindus believe fake god sai baba, who are originally Bhakts of Tridev (Sagun and nirgun roop; Lord Shiva, Lord Vishnu, Lord Brahma), the followers of false god sai baba started inserting this mleccha’s photos in between revered Hindu gods. Interrogation of the priest of sai baba temple where Lord Hanuman idol was replaced with filthy pir sai baba. Sanatan Dharma does not advocate worshiping TAMASIC and MLECHHA people. 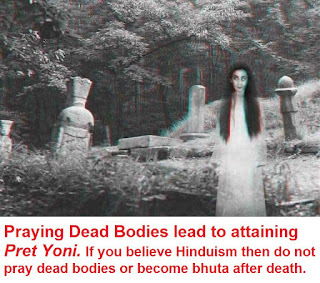 Moreover Shri Krishna clearly says in the Gita 9.25 that all those who worship Graves/ dead souls will goto Preta Yoni (प्रेत योनि). Hindus must remember one simple thing that Vedas and Puranas clearly mention that at the end of Kaliyuga, Lord Vishnu will take Kalki Avatar to annihilate the adharmis and make way for Satyuga. There is never any mention of any other Avatars apart from Kalki Avatar that too at the end of Kaliyuga. So called god Shirdi Sai Baba, a meat eater was neither an avatar nor a god, has no mention in any Vedic texts. Do not donate your hard earned money on the mazar of muslim fakir chand miya. Sai Baba’s followers are using Sai Baba as a brand name in Shirdi and other cities to collect millions of funds from Hindu devotees and then siphon off the money, it is also controlled by regional ministers so everything is managed, loot is still ongoing. The most painful factor is that these so called Sai Baba Sansthans or Trust never utilize money in development of poor Hindus or on free hospitals or free schooling. All funds received from Hindu devotees arefraudulently distributed among trustees.